The main subsection under the Schedules area is My Schedule. 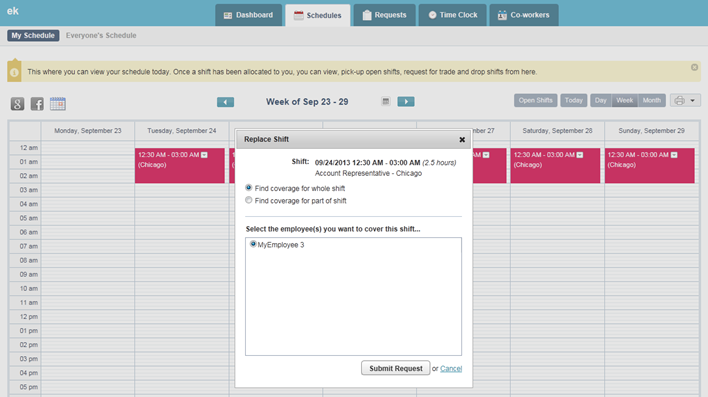 Employees can view the other subsection “Everyone's Schedules” only if the admin has allowed them to. Then you can select the shifts you want to trade with and submit your request. N.B. Have in mind that your co-worker and your manager must approve this shift trade request. They may reject it for some reason. A dialog box will open where you have to fill out the reason for dropping the shift and to submit your request. N.B. If you don't see this option on My Schedule, please ask the administrator of your company's account to enable it. When select "Find replacement" a dialog box will open where you have to select if you need to find coverage for a whole / part shift and to select a co-worker who you would like to replace you. Then you submit your request. After you submit the request, your co-worker has to accept it and to pick-up the shift (on My Requests - Shifts Available for Pick-Up page). N.B. your manager has to approve your requests (or he may reject them). To view your shift requests, go to the "Requests" tab. There you can see your shift requests and their respective status (Pending, Approved or Rejected). For more help about requests, please click here.